The other day in the Buttes-Chaumont, I was almost hit by a falling conker. I picked one up , rubbing its shiny surface, whorls of colour in espresso and caramel. One autumn my brother and I collected enough to fill a hammock. I’m not sure what for, except that each one was shinier and more covetable and was thus added to the collection. I would keep one in my pocket as a talisman until it dried out and wrinkled. 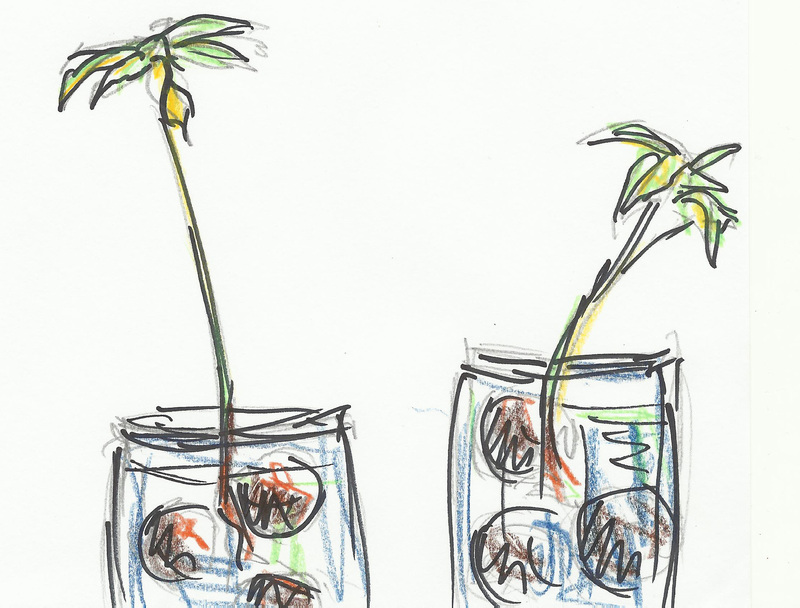 Everything in the garden could be made use of, though not always successfully. Further round from the nursery window the japonica fruit made very good doll’s apples and near those my father fixed up what must then have been the latest fashion, devised by his friend Clarence Elliott of Six Hills Nursery. It was an alpine sink, made from one of the stone feeding troughs then being thrown out by up to date farmers. It had been propped up by a brick pier at each end and carefully planted with small alpines and rocks. Now each autumn my sister and I puzzled as to how to preserve the wonderful sheen on the newly opened conkers. We had tried shoe polish but this was not a success and in the autumn of the alpine sink we decided just to keep the conkers in water, which seemed to preserve that wonderful chestnut colour. We put our best conkers in jam jars, filled them up with water and put them in what seemed to be a convenient and safe place, under the piers of the alpine sink. Then, as so often, we forgot about them. In the spring there were cries of despair from my father. The conkers had sprouted and, such is the power of nature, their sprouts had dislodged the alpine sink, scattered the precious plants and totally spoiled the effect. We were in disgrace. Not much changes between generations. I love the idea of shoe polish. 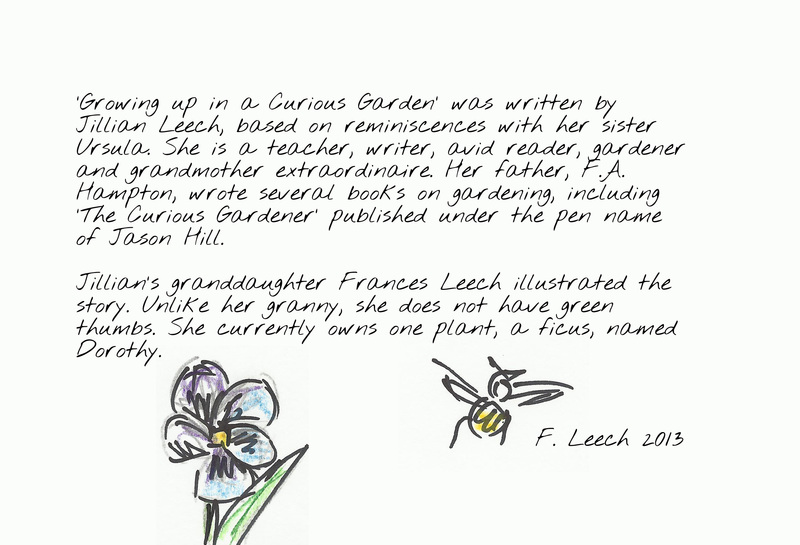 Her father was a great gardener and wrote several books on plants. Her love of gardening shone clear. Except for certain pink flowers, she hated pink. Her daughter and daughters-in-law (my mother included) learned everything from her. 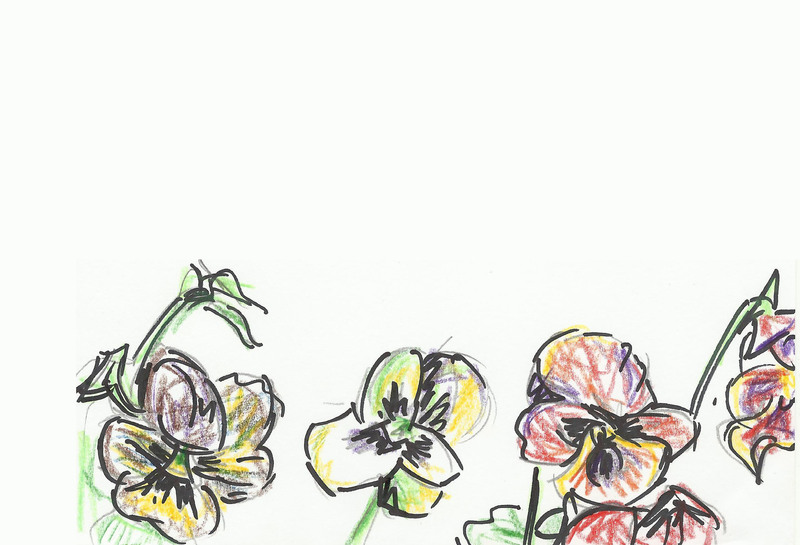 My aunt said that she never had to remember the names of plants; Granny was an encylopaedia. She was incredibly knowledgeable about literature as well, but she rarely showed anyone her writing apart from the ‘Naughty Harold’ stories she typed up for us as children. 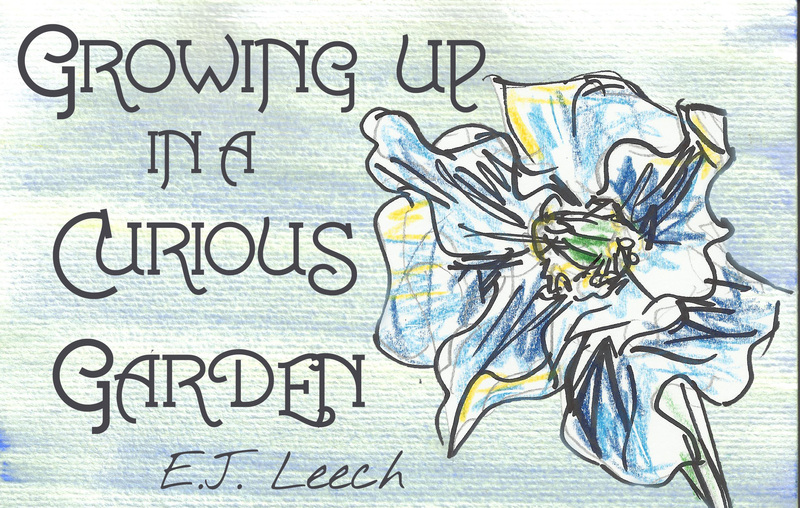 ‘Growing Up in a Curious Garden’ is a short story and memoir based on reminiscences with her sister Ursula. 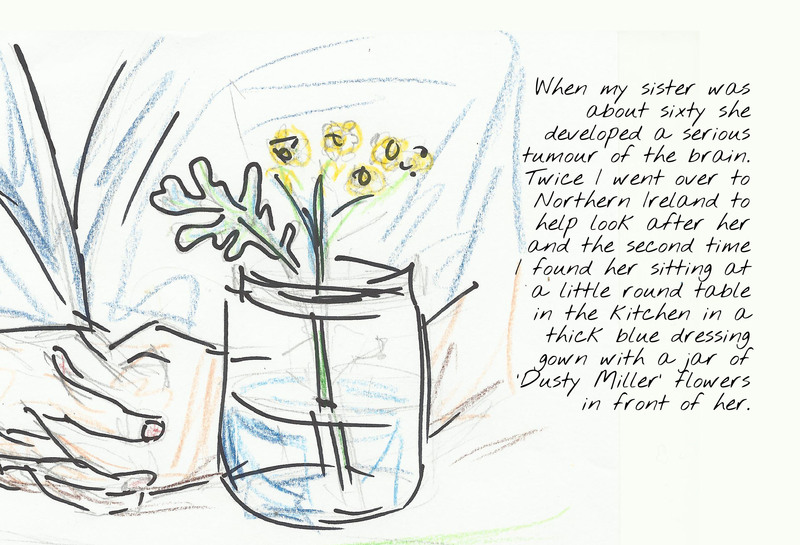 My granny Jillian walks the reader around their childhood garden, picking out plants and telling stories, She seemed to anchor her memories with flowers the way I do with food. (Which is not to say that she didn’t love to cook; I have already written about her lemon drizzle cake, her brownies and old-fashioned oatcakes.) This story is so vivid, so sharp and well-told without being sentimental that one day I sat down to illustrate it, though I had to google a lot of the plants. She saw it before she died, and politely informed me that some of the colours are wrong, including the Himalayan poppy on the front cover. I claim artistic licence. It is not very long, only 3000 words. I wanted it in the style of a children’s book, giving due space to her words. Now it is a 38 page book, illustrated and printed in a large font similar to her italic black handwriting. It isn’t much, but it is a tactile memory of her as a daughter and sister, and as a mother, grandmother and writer. I have printed a few copies of ‘Growing Up in a Curious Garden’ with the excellent Parisian photo service, Negatif Plus. If you would like one, please write and let me know. The cost covers printing and postage, no more. Mostly, I would like to share her words. Details: 38 page book, 21x14cm, printed on 300g matte paper with a soft cover. Love the new cover design – wonderful tribute!